I love bird nests. They are such beautiful works of art, with each one so unique, and each one woven with different found objects from nature. I started a small collection of nests when I lived in Maine. When I was packing up to return west, I gave my collection to my dear neighbor, who had a collection of her own. My husband Mike comes across a lot of abandoned nests when he's in the field for work. All of these nests are ones he has brought home to me over the years, which I tucked away for safe keeping. They are all so distinct, equally rugged yet graceful. Each fragment of their construction is so fragile on their own, yet woven together they collectively become strong. This wirey nest is woven together with a mix of fine thread-like branches, what looks to be horse hair, with a little fishing twine thrown in for good measure. I found the robin's egg on one of our walks. On its back is a sweet little hole from which the robin chick popped out. This nest is an intricately woven wheat vessel. I love the wheat flower tucked in along the rim. Plastered with dry dense mud on its exterior, this clay nest is sturdy and strong. Feathery golden grass blankets the interior. When Mike brought me this moss nest, it was almost electric green. Even now, several years later, it still smells like the damp lush Pacific Northwest woods. This is a Maine nest. It was the very first that I collected, and it is the only one I brought with me when I moved back west. She is one of my most sentimental momentos from Maine, reminding me of the many hours I spent in the Maine woods. This nest also reminds me of my dear neighbor in Maine. When I gave her my collection of nests, she shared with me a story about her mother who had recently passed away. Her mother loved birds, and made it her practice to always set the hair from her brush outside for the birds to use in their nests. Her mother had been ill for several months and finally passed away in summer. By fall, my neighbor was closing her mother's estate and while walking in the garden, noticed a bird's nest visible through the barren autumn trees. When she looked closer at the nest tucked safely between the cradling branches, she saw that the sweet little nest was woven with beautiful white shimmering strands of her mother's hair. I'll never forget that story, especially when I see a nest and recognize all of the beautiful unique items used to create it. As someone who is passionate about the warmth and coziness of our home, I admire and respect the birds loving devotion to creating a warm and safe place to cradle their young. What a lovely story about your old neighbor and her mother's hair! When the hurricane hit last August we lost a huge Osprey nest in our yard that the Osprey had worked on for the past 4 years. Each year they added to it and made it their home, so it was so sad to see it in pieces on the ground following the storm. We can only imagine how sad they will be this spring when they return and find the tree is gone as well as the nest...which we estimate to have weighed over 500 lbs. 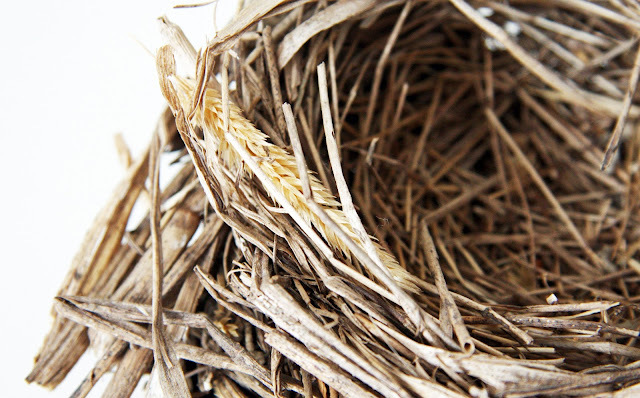 Your nest collection is beautiful and what a treasure to have! This was such a beautiful post. The story about your neighbor's mom was so touching, my eyes were welling with tears. Thank you for sharing the lovely story and lovely photos of your nest collection:). what lovely pictures, and what a touching story.. it's all about how things are passed on... the birds passed their no-longer-needed nests to your husband who passed them on to you.. you passed the nests to your neighbor and she passed the story to you.. a story about her mother, who passed her strands of hair on to the birds to use, who passed the gift of a memory back to your neighbor.. a memory about her mother, who had passed on. and now you are passing this story along to us.. thank you! Lovely story about your neighbor's mother. Thanks for sharing! 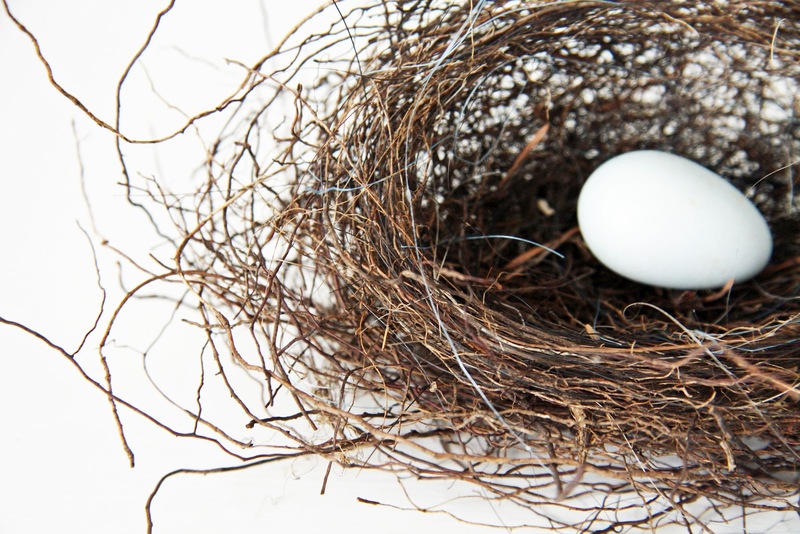 What a lovely story about the old lady's hair in the nest! 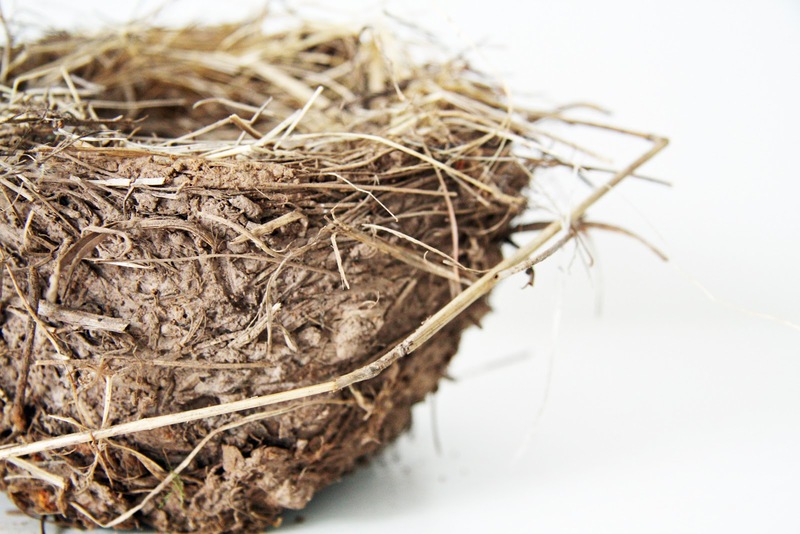 Birds' nests are special and intricate. I cherish the house martins that nest under my eaves every summer. Some don't appreciate them since they soil the house wall, but I think it is only very little, and also a very small price to pay for the joy of seeing the parents bringing food in and the chicks learning to fly. trina this is such a sweet story. i too collect nests. most of them have been collected on golf courses of all places. i know ladies that routinely throw thread and string throughout their gardens just for the birds. i've never thought of using hair. that is really sweet. Such a beautiful story. I too collect bird's nests. This Christmas we couldn't decide on a Christmas tree until I saw one with a little bird's nest inside. I knew that had to be the one. Although the tree is long gone, the nest has been added to my collection. May the spring bring many more finds for both of us. delighted to know we share this passion. I have several nests - some on our side porch and some under glass domes in our den. It IS such a wonderful thing to discover the items they are made with. the story about your friend's mom is lovely. I too collect bird nests—I keep them in a wonderful old cabinet made by my grandfather! My nephews especially love to bring me nest that they have found. A few years ago, I started to document who found the nest, along with where, and when the nest was found. I simply write it on a small label and put it inside the nest. It is fun to take a walk down memory lane and recall when the nest was added to the collection! I so appreciate the story you shared about your neighbor—thanks for sharing! What a beautiful story to cherish! I love nests, but do not have any 'real' ones in my home. Someday I hope to find some!! What an absolutely beautiful post – one of my favorite to date. I doubt I will ever forget that story. . . and I’m now inclined to brush my long curly hair in my backyard - which is also my haven for birds. What a special gift to find a nest woven with her Mother's hair. Something about finding a nest is like finding a treasure. The miracle of nature! Oh my word, I am in tears from that incredible story. How amazing the Lord created these wonderful creatures. What a sweet story to share! I love nests too and love how in winter you can see them in the no-longer-hidden branches of the trees. So much warmth and love going into them, makes me think of my own home too. Thanks for this beautiful reminder! My home is an forest setting which is also the habitat for many species of birds that includes eagles, parrots, robins, thrushes, doves, finches and honeyeaters which extract nectar from flowers right outside the window. It is a birdwatchers dream location. We also have bowerbirds here that construct bowers to attract females giving real meaning to the term love nest! I once came across one once on the forest floor and it was incredible, decorated with blue clothes pegs that a satin bowerbird had stolen from our yard to use as ornamentation. These birds both paint and decorate! They even use twigs as a paintbrush to apply saliva to the walls of their bower which may be dyed from the juice of berries. The female chooses their mate on the quality of their bower and prefer well built and decorated bowers that have lots of treasures! I, too, enjoyed your sweet story. When my children were in elementary school I helped to teach a parent-led science class. We learned all about birds and their nests and I have been in awe ever since. They are absolutely the most amazing creatures and I watch them with the utmost respect now. I too collect nests. It's really easy for me since we live in the N.C. woods. I am crazy for your moss nest. I haven't seen one of those before. The most precious nest I have is that of a hummingbird. It is so tiny and soft yet strong. Thanks for sharing your neighbor's story. It is very touching. The gifts that birds possess in creating their amazing little (or sometimes big) homes is remarkable...and the story of your neighbor's mom is as much of a treasure as these beautiful nests are, so touching. Thank you so much for sharing your sweet story and collection with us Trina...it was very special! Such a touching story Trina! I too love bird's nests. I have one we found last summer with a hollowed out egg inside that I keep in my glass top curio coffee table. We have several nests on the underside of our deck as well. I love springtime when the birds come back and build new ones. ohmy!!! that sweet story gave me chills... so, so sweet. we just never know the lifeprint we leave, where, or how. I love your collection. When my dogs were alive I sued to comb them outside and then put the hair in the cedar hedge for the birds. I would often see nests lined in golden fur or chocolate, and we even found a rabbits nest full of it. So sweet. Your friends story is delightful. Beautiful touching words . . . I too collect birds nests and have done so for years. Others know of my collection and we will often find a nest sitting near our front door or the bell ringing to bring one to me in person. In the years when I would have a fresh spruce and/or fir tree in each of the rooms for Christmas, they always had a nest tucked in the branches. I still put a nest in our now, "one tree" and this year it was a nest inside the branch it was on when it was given to me. Love the story of the silver white hair of her mom's, found in the nest. I would love to be able to see the birds in the process of building . . . each intricate to their own. Thank you for this beautiful treasured message. What a sweet, touching post. Beautiful works of art. Its also amazing isn't it that a tiny bird can accomplish so much. I will never look at a bird's nest the same again. 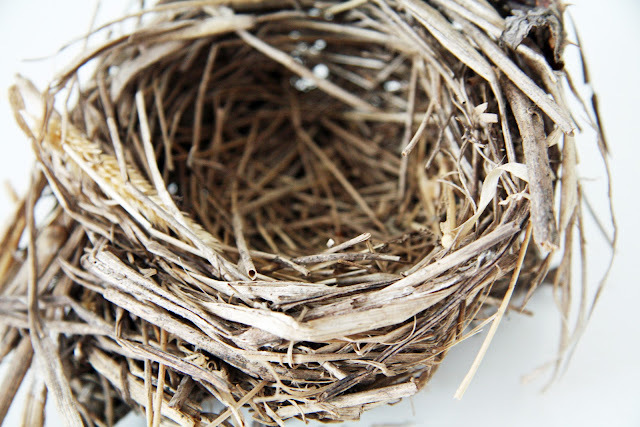 I can't wait to share your post with my daughter, who collects bird's nest. this is one of the coolest posts i've read in a long time. what a cool way to see his mother live on. thanks for sharing this. Oh, what a lovely post. I, too, am a collector of wind-downed bird nests. They are such works of art. I took my mother's collection when she passed, and have them displayed in lots of little places. Your story about the bird nest with hair reminded me of a favorite part in the children's book, Sarah, Plain and Tall. She saves the curls from the children's haircuts, tosses them in the wind, and tells the children they will look for "nests of curls" in the spring. 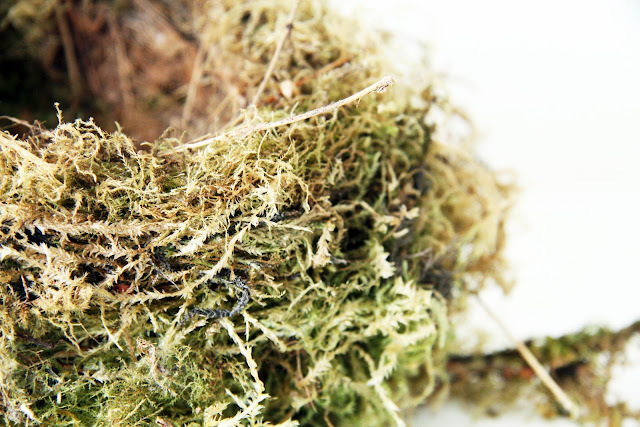 Living on the prairie, I have never seen a nest like yours out of moss. How beautiful. Thanks for sharing. I love this sweet story, and my love for nests has increased because of it. What a sweet, caring thing for your neighbor's mom to do! I may just have to follow her example. I spent most of one day last fall watching the birds harvest the mock cherries (?) from the lovely tree outside the windows of our study-dining room. For one season some birds chose to build their nest just outside that same window, but never since. I, too, have collected nests in the past. They're lovely and somehow validating, as I, too, am a nest builder. Your neighbor's story touched my heart. And your collection is just beautiful.Now, I want to go bird nest hunting. I too have some nests and love the look of them. I love the idea you saved the moss nest from Maine. Such a great reminder. The story about the neighbors hair is so sweet. I just bet your friend was so touched to see her Mom's hair in that nest. Thank you for this wonderful post....just what I needed today. 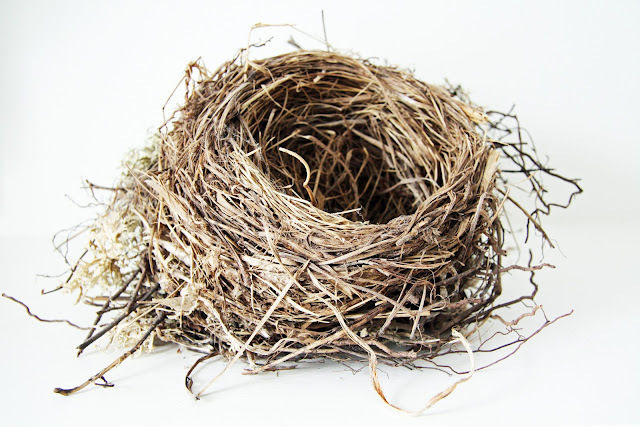 Instinctively, birds create nests and no two are ever alike. I think our homes are like that too. You always inspire me with your passion for creating a cozy nest. Oh- me too! I blog at The Empty Nest Mom. because i am an empty nest mom and I love nests and birds and so enjoyed this post. Such a sweet story about your neighbor's mother. Every kind of mother on earth strives to create a sheltering nest for her children and find beauty therein. So glad I stopped by this morning. My Mama grew up in Maine. When she would trim our hair when we were children she also threw our hair outside, telling us the birds would use it in their nests. I got a bit teary eyed reading this post. Mama passed away last winter. Unless they have fallen out of a tree, birds would have continued to use these nests. Basically, you are taking perfectly good nests that some bird would find and use. Or the actual builder might be back next spring to use again. We have nests in our front trees that are used every spring for the past 30 some years. I love this time of year when the song birds are in the trees. We put up a bird house and I hope it gets occupied. These are all so beautiful! You've inspired me to keep the nest I find from time to time, for my own collection. It is definitely our practice to only collect fallen nests. We've always heard that many birds don't re-use their nests, but some do. I love the sentiment expressed in this beautiful post! 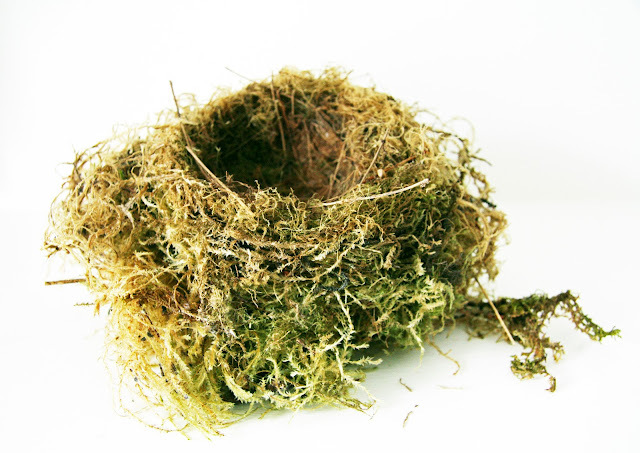 My mother saved a nest made of horse hair - it is better than a Faberge egg. What a beautiful story-and how lovely that you gave her the nests-all in the circle of life! I Love this post - what a great story... and beautiful pics (of course) You always do such a great job! Thanks for sharing... Have a great day! Love the story & the pictures are beautiful. I, too, collect birds nests & have been doing so for years. My problem is finding places to put them. Where do you display your birds nests, Trina? I keep my collection in my Great Great Grandfather's old lawyer bookcase. The glass protects them from dust. What a wonderful post! I love the beautiful images you have taken, so we can really see and appreciate the "workmanship". My mother - who lives in a rural area in Denmark - also collects nests. from time to time one makes it into the living room, but often they are tucked in windowsills and in the foyer. When I last visited she had a small nest, it was completely lined with hair (probably from the horses), and it looked like the coziest little nest ever... When we had a long haired dog (while I grew up), my mom would always leave the brushed hair outside for the birds! You just took me down memory lane :) Thank you! What a lovely story and I will now do the same. Love this story. We found several nests this year with hair from our horses. It is very special to have them decorate our home. I have always had a love of nest but now they are extra special. do you keep them where they are out where you can enjoy them? What a fabulous and sentimental post. I cannot get over the stunning images you took of each nest. What a great way to document the circle of life. Thank you for sharing! Your nest collection is beautiful. The one of moss and the tiny perfection nest were my favorites. I have one nest that survived being blown out of the tree in a storm. It had the little round centers of sycamore balls woven into its design. Maybe mama bird put them in the design just to get herself in the egg laying mood. I loved the story about your neighbor's mom putting hair out for the birds. Wonderful that your neighbor got to see the bird nest that her mama helped make. I am going to go and get the hair out of my brush as soon as I am finished here. I hope the birds like L'Oreal's Toasted Cocoanut as part of their color scheme. Your story brought back so many lovely memories of my grandmother brushing her long gray hair in the garden just so the birds could use the strands for their nests. I too collected fallen nests, but after being bitten by bird mites I stopped. It was horrible! Nests must be treated before you touch them. Please google bird mites before you touch any more nests and please be careful. Hi Trina, thank you for allowing us to follow your progress; your blog is very beautiful and interesting to read. Nothing prettier than a neutral/white palatte, is there? And when combined with nature/natural items, art, approach...it's even prettier. Soothing to the soul and pleasing to the eye for sure. I much prefer the copy layout that is justified left, rather than centered. Centered copy is very difficult for the eye to follow as a reader, even though you may prefer the 'look' of the page more. For this reason, it is usually avoided in advertising, etc. I guess the decision before you is whether you're art directing your blog to please you, or your readers. A very legitimate question with no wrong answer! I keep hoping that you will show us th more 'real' side to you, your home, your life. The carefully art directed photography is so beautiful...but often not 'real'. You're surrounded by beautiful things but I'm sure you don't live your day to day lives like you're on a magazine photo set. (If you do, that's a whole 'nother topic!) 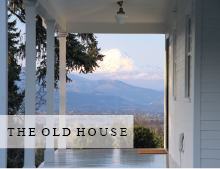 We'd love to see how you really live...with the occasional shoes on the floor, pillow awry, toys scattered around, and not-quite-so-sterile countertops. Trust me, we'll love and admire you just the same...maybe more! And finally, it must be very satisfying to have purchased such a beautiful plot, and such a wreck of a house, and turned it into your own beautiful enclave, done just as you wish. It's such fun for 'outsiders' to watch and experience along with you. As a recovering perfectionist myself, I just encourage you to stay relaxed about it all...your husband and beautiful kids will thank you. We find nests with hair from our horses' manes and tails! My kiddos think it's so cool...they can even determine which horse hair is whose! It's interesting that you mention the Maine woods....we moved up here to Maine almost 8 yrs ago from TX. I also spent a summer up in the Pacific NW...a similar feel to Maine in many respects. Enjoying and 'collecting' nature is one of our favorite simple pleasures! Hi Trina! 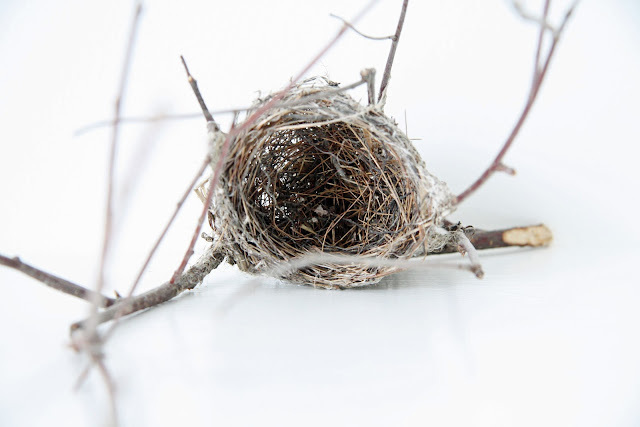 The photos of your nests are stunning. Thank you for sharing them with us. Your blog is a beautiful respite from a crazy world, please do not change a thing because one reader has issues. I think your readers seek you out for the peace and calm you instill in all of us when we visit. To assume to know how you live, and then to be so judgemental of your life is just plain arrogant. The comment sounds more like jealousy than "feedback". Tracy needs to remember this is a blog, not a reality show. Thank you for all the time and work that you clearly put into your blog. You are so kind to share your beautiful world with us. Que emocionante,lindo post,obrigado.Cravo-da-índia espetados em cascas de laranja matam ácaro de pássaros e traças.Tenho sempre alguns sachês próximo dos tecidos e livros. DEUS TE ABENÇOE. Haven't been on blog for a while, glad I got on to see your wonderful post. Beautiful pictures, beautiful text. My family leaves hair and stuff for the animals and birds as well, just naturally you know? Awesome. Awesome post. This story warmed my heart and made me smile. Thank you. I thought I should write as there seem to be so many readers who also do not know this. I do not mean to be harsh at all. It is more to let people know the 'spirit" of the law. So many times we are expressing our delight in wildlife and we unfortunately endanger the wildlife. Anyway, thank you so much for your inspiring blog! I think you are my go to person on my bird nest question. My grandson found a birds nest that had fallen out of the tree. I put it on the patio table and left it there. The next day when he came by he wanted to know where his nest was and could he bring it in the house. I told him until I could find out how to clean it it needed to stay outside. Since you collect them can you tell me is there a way that I can clean it up a little before bringing it in? I live off a lake that is surrounded by a nature preserve, lots of trees and ALOT of birds, ducks geese and swans that hang out in my driveway (doesn't hurt that I feed them). So I see a lot of nests in the trees. 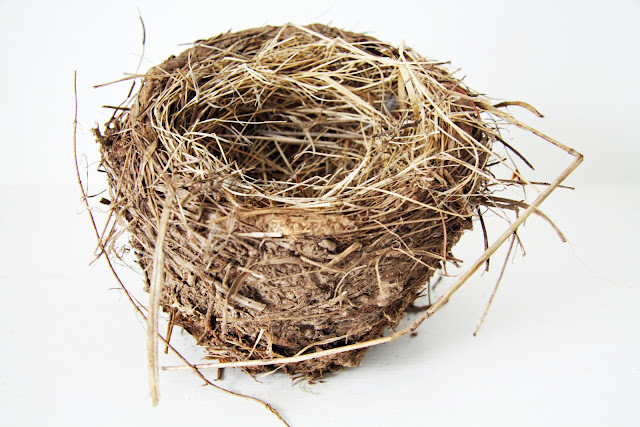 But not being a nature person I always thought that birds reused a nest. Do you just take the ones that have fallen? Any and all help on birds nests would be great. I have a feeling my grandson has a new found passion. I don't really know how you would clean a nest. When my husband brought home ours, I set them each aside in our covered bookcase and washed my hands after holding it. With children, I'd be even more careful. I love the idea of sharing nature with children, especially if they are already so excited about it! After sending you a post I started searching around the internet looking for "cleaning an outside birdsnest. Couple different ways. One way is store in a ziplock for a couple days another is microwave it for a minute. Both ways will kill any bugs that might be on the nest. I think I will try them and then maybe make him a little terrarium so that he won't be handling it. I love looking through a childs eyes. He loves going over by the lake and seeing all the wildlife it offers. The next couple months will be extra sweet. New babies everywhere. Thats a whole different topic. Happy Easter and thanks very much.